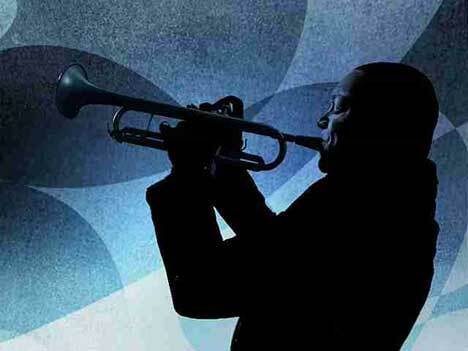 Wynton Marsalis, American composer and trumpeter, featured in one of Apple’s latest iPod silhouette TV commercials. Against a blue abstract background, Marsalis plays ‘Sparks’ with members of his quartet while two dancers groove to the tune. The ad was first shown during Steve Jobs’ address to the San Francisco Mac World conference earlier this month. Marsalis and his quartet were guest live artists at the Apple conference in San Jose, October 2005.
iTunes Store features the commercial as part of Wynton Marsalis ‘Live Session’ EP (iTunes Exclusive). On the digital album iTunes have put the music for Sparks, Oh Row That Boat, and ‘Quick Ate’. The three videos on the album are the 30 second ad, a 3 minute behind the scenes look at the ‘Sparks’ commercial (including interview with Marsalis), and a 15 minute video recording of Marsalis performing ‘The Magic Hour’ live in San Jose. Click below to preview and purchase the Live Session Album at iTunes Store. Anyone know who the other members of the Wynton Marsalis Quartet are? I believe they are Marsalis on trumpet, Dan Nimmer on piano, Carlos Henriquez on bass and Ali Jackson on drums. The Sparks ad was developed at TBWA\Chiat\Day, Los Angeles, by worldwide chief creative officer Lee Clow, creative directors Duncan Milner and Eric Grunbaum, art director Demian Oliveira, copywriter Krista Wicklund and agency producers Mike Refuerzo and Sofia Akinyele. Filming was directed by Mark Romanek with Logan, via Anonymous Content, with director of photography Jo Willems, production designer Keith Ian Raywood, executive producer Dave Morrison and line producer Tapas Blank. Editing was done at Nomad Editing by Glenn Martin with executive producer Susye Melega, producer Nicole Steele, assistant editor Jim Rodney, music editor Francois Blaignan and music assistant. Design, animation and visual effects were done at Logan under the leadership of creative directors Alexei Tylevich and Ben Conrad and executive producer Kevin Shapiro. Special effects were developed at Company 3 by Alex Brodie, with colorist Stefan Sonnenfeld.